Those in the furniture industry who invest in new designs are in a constant fight to protect those designs from others who would rather spend money on designs after they have proven popular. Historically, design patents have been one tool used by companies trying to protect their new designs. The expense is relatively minor for obtaining design patents, and the value can be extremely important in, at a minimum, deterring companies from the potential exposure of infringement. This article is designed just to introduce you to the requirements for obtaining a design patent. The Patent Laws. When most people discuss “patents,” they are typically referring to “utility patents.” A utility patent covers a “new and useful process, machine, manufacture, or composition of matter, or any new and useful improvement thereof….” 35 U.S.C. § 101. A utility patent is considered as protection for the “function” of an item; it is valid for up to twenty (20) years from the date of application subject to certain conditions. A design patent can be issued for “any new, original, and ornamental design for an article of manufacture….” 35 U.S.C. § 171(a). 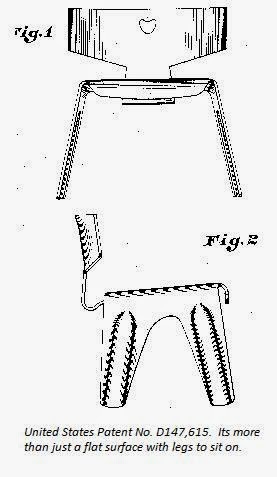 A design patent, therefore, protects the way an item “looks.” A design patent is valid for up to fourteen (14) years from the date of the patent grant. “The language ‘new, original and ornamental design for an article of manufacture’ set forth in 35 U.S.C. 171 has been interpreted by the case law to include at least three kinds of designs: (A) a design for an ornament, impression, print, or picture applied to or embodied in an article of manufacture (surface indicia); (B) a design for the shape or configuration of an article of manufacture; and (C) a combination of the first two categories. Best Lock Corp. v. Ilco Unican Corp., 94 F.3d 1563, 40 USPQ2d 1048 (Fed. Cir. 1996) (Newman, dissenting); Manual of Patent Examining Procedure § 1504.01 (8th ed. 2001 rev. Oct. 2005). To qualify for patent protection, a design must be inseparable from the article to which it is applied and cannot exist alone merely as a scheme of surface ornamentation. It must be a definite, preconceived thing, capable of reproduction and not merely the chance result of a method. Manual of Patent Examining Procedure§ 1502 (8th ed. 2001 rev. Oct. 2005). A broad definition has been given to the phrase “article of manufacture” to include a “sarcophagus monument” (Crier v. Innes, 170 F.324 (2d Cir. 1909)), a “grandstand” (In re Hadden, 20 F.2d at 276 (D.C.Ct. Appeals ), but not a water fountain which was believed to be merely “a fleeting product of nozzle arrangements” (In re Hruby, 373 F.2d 997 (CCPA 1967). 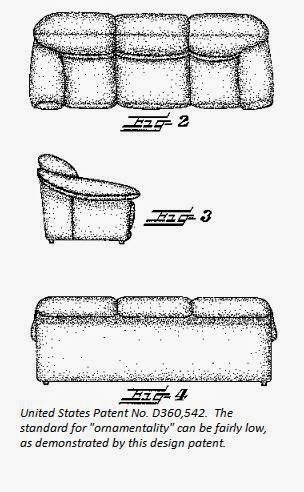 Requirements for a Design Patent. 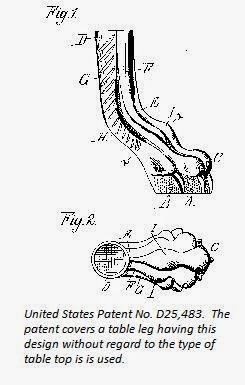 The Manual of Patent Examining Procedure establishes that “ornamentality, novelty, nonobviousness, enablement, and definiteness” are prerequisites to the grant of a design patent. Manual of Patent Examining Procedure (8th ed. 2001 rev. Oct. 2005) §1504. To be ornamental, a design must present a pleasing aesthetic appearance and must not be dictated solely by functional considerations. See, e.g., In re Stimpson, 24 F.2d 1012, 1012, 58 App. D.C. 86 (D.C. Cir. 1928) (design of rivet-setting machine not patentable; “There is nothing about the assembled mechanical device which serves to beautify, embellish, or adorn it. …The design in issue may be new and original as to form, but it is not ornamental, inasmuch as it does not please the senses or excite the emotions by its color effects, or by its proportion of form. It is not necessary that the design … should be a work of the fine arts, but it is necessary that the design should be … either embellished or adorned, or distinguished by its grace of symmetry of form.”). 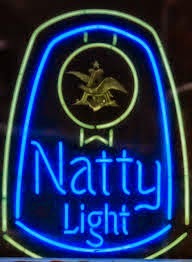 The requirement of “novelty” or “nonobviousness” is determined by a review of the ornamental shape or configuration of the article in which the design is embodied or the surface ornamentation which is applied to or embodied in the design. Id. In other words, the Patent Office will search other designs, catalogs, and trade journals to determine whether the applied-for design is “new” and not obvious in light of previous designs. The claim must be nonobvious when compared with prior art using two tests:  (A) if an ordinary observer purchases an article supposing it to be the other; it is obvious; and (B) if the design appropriates the point of novelty that distinguishes the patented design from other prior art, it is obvious. Bernhardt, L.L.C. v. Collezione Europa USA, Inc., 386 F.3d 1371, 1373, 72 U.S.P.Q.2d 1901 (Fed. Cir. 2004). Design Must be Nonfunctional A design that is dictated by considerations of function is not a proper subject for a design patent. Further, if the sole points of novelty over prior designs are dictated by functional improvement or alteration, a design is not patentable. Parts of Articles can be Protected Section 171 also authorizes a patent claiming the design for a part of an article. In In re Zahn, the court determined that a design need only be embodied in some article, but did not need to be a design for a complete article. In Zahn, the design patent was embodied in the shank portion of a drill. 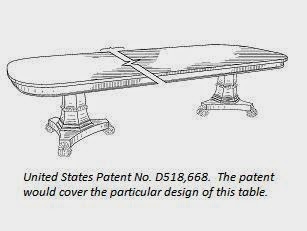 As seen in the figure, below, design patents are available on just the “table leg” which would protect the use of the table leg with any type of table top. Conclusion. If you invest in new designs for furniture, and you are tired of having your new designs copied and sold at lower cost, protecting your new designs with a design patent can prove beneficial. A later article will address the question of infringement of such patents, but most decisions would prevent an exact knock-off of your design. A design patent can significantly help in your pursuit of such knock-offs, provide enhanced damages for such infringement, and thereby protect your investment.. If you would like to discuss the availability for design patent protection or a dispute arising from the alleged infringement of a design patent, please contact Bert Andia at (336) 273-1600 or bandia@greensborolaw.com. The North Carolina Business Court continues to be a battleground for disputes involving alleged misappropriations of trade secrets. These lawsuits typically target disloyal former employees, but in a recent opinion, the Business Court allowed claims against non-employee defendants to move forward. The plaintiff in Koch Measurement Devices, Inc. v. Armke, 2013 NCBC 48 (Oct. 14, 2013), is a wholesaler of high-end “beer growlers”—collectible glass jugs typically used to transport draft beer out of craft breweries. Koch sued its former web designer and web host, Michael Walsak, and Tote Glass, Inc., a company in which Walsak held an interest, alleging that Walsak and Tote had conspired with Koch’s former (and now-deceased) President to divert Koch’s assets, business opportunities, and trade secrets to Tote. In particular, Koch’s complaint alleged that Walsak and Tote misappropriated confidential information including Koch’s customer lists, the ordering habits and history of Koch’s customers, and Koch’s pricing and inventory management strategies; diverted Koch’s inventory to Tote; imported growlers from Koch’s German supplier; used Koch’s glass decorator; used the same pricing schedule as Koch; stole Koch’s largest client; and removed Koch’s website from the web. If you would like to discuss a trade-secret misappropriation issue contact John Bloss at (336) 273-1600 or jbloss@greensborolaw.com. But I Wanted that Domain Name!! enterprise, and you should endeavor to pick a domain that cannot be disputed. This article uses the case of Disney Enterprises, Inc. v. McSherry, 2003 NAFDD LEXIS 11339 (June 17, 2003) to illustrate the domain dispute process. and, probably, at Disney’s theme park. She began renting her own home, as well as the homes of others. Eventually, she was renting 55 homes in the Orlando, Florida area and started a business named Florida Vacation Homes, Inc. She registered the domain name www.disneyvacationvillas.com thinking that travelers looking for a single family house in close proximity to Disney® might be attracted to her website. Janice operated her business for three (3) years – and then she got a certified letter from Disney Enterprises, Inc. claiming that she was improperly using the Disney trademark, and demanding that she transfer ownership of her domain name to Disney. Janice quickly found out about an administrative procedure specifically set up for disputes over domain names. Since it was launched in December 1999, the Uniform Domain Name Dispute Resolution Policy (UDRP) is the mandatory global procedure for resolving disputes over all top-level domains and some country code top-level domains. The UDRP was established in response to individuals registering domain names using well known trademarks (also known as “cybersquatters”), without the trademark owner’s permission, hoping to sell the domain name at an inflated price. Currently, the UDRP procedure is provided by The Asian Domain Name Dispute Resolution Centre (ADNDRC), the National Arbitration Forum (NAF), the World Intellectual Property Organization (WIPO), the Czech Arbitration Court, and the Arbitration Center for Internet Disputes. Identical or Confusingly Similar. Disney provided evidence of its registration of the mark DISNEY®. The one-arbitrator panel determined that Janice’s domain name was confusingly similar to the DISNEY® mark. The inclusion of generic words, or ordinary descriptive words (like “vacation” and “villas”) was found to be insufficient to detract from the overall impression of the dominant part of the name. Note that common law or unregistered trademark rights are sufficient to show rights in a mark for the purposes of the UDRP. Rights or Legitimate Interests. Under UDRP policy, if the Complainant can prove that Respondent had no rights or legitimate interests for Respondent’s use of the mark, the burden of proof on this element shifts to Respondent to prove rights and legitimate interests in the domain name. The UDRP provides examples of how Respondent might prove a legitimate interest in the domain name: (1) by proving that, before receiving any notice of the Complainant’s rights, Respondent used the domain name in a legitimate manner; (2) by proving that the domain name corresponds with a name by which Respondent is commonly known; or (3) by proving that Respondent is making a fair non-commercial use of the domain name. Janice introduced evidence that, for a number of years prior to receiving notice from Disney, her company was known as Disney Vacation Villas. However, the panel found that Janice did not, and could not, demonstrate that she was known as Disney Vacation Villas prior to registration of the domain name. Janice also introduced evidence that she was making a bona fide offering of service on her website. However, since Janice admittedly used the word “Disney” in her domain name to attract Internet users to her site and since Janice was in competition with Disney for vacation rentals, Janice’s use of the domain name was found to be in violation of UDRP policy (use which intentionally trades on the fame of another cannot constitute a bona fide offering of services). Registration and Use in Bad Faith. UDRP policy provides four non-exclusive examples of bad faith use and registration: (1) circumstances indicating that Respondent has registered the domain name primarily for the purpose of selling, renting, or transferring the domain name to the Complainant or a competitor of Complainant for valuable consideration in excess of the Respondent’s documents costs directly related to the domain name; (2) Respondent registered the domain name in order to prevent the trademark owner from reflecting the mark in a corresponding domain name provided that Respondent has engaged in a pattern of such conduct, (3) Respondent registered the domain name primarily to disrupt the business of a competitor; or (4) Respondent intentionally attempted to attract, for commercial gain, Internet users to its website by creating a likelihood of confusion with the Complainant’s mark as to the source, sponsorship, affiliation, or endorsement of Respondent’s website. Disney set to prove “bad faith” under the fourth example, i.e. that Janice was intentionally using the domain name to attract Internet users to her website by creating a likelihood of confusion. Janice countered that argument by establishing that her website was designed to avoid any confusion with a Disney-sponsored website, including the use of a disclaimer. Janice provided information from consumers that they were not mislead or confused when viewing her website. The panel, however, decided that Janice admittedly chose to include “Disney” in her domain name in order to attract Internet users looking for rental properties close to Disney’s theme park. Janice also admitted that Disney® provided rental lodging within the theme park and, therefore, she was in competition with Disney®. 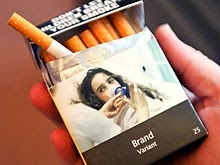 Therefore, the panel concluded that Janice’s use met the standard for “bad faith”. The panel ordered that the domain name be transferred from Janice to Disney. For more information on disputing a domain name or registering the correct domain name please contact Bert Andia at Higgins Benjamin PLLC. bandia@greensborolaw.com (336) 273-1600.